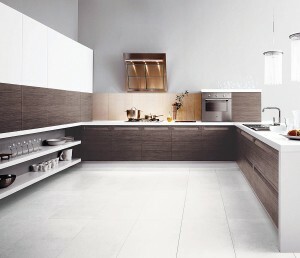 Wall panels can be an important detail in an outstanding kitchen. You can use them as a main material on the wall (as opposed to paint, for example), or to add interest to a certain part of the kitchen – as a decorative element. We’ve already talked about kitchen splashbacks, cupboards, and benchtops, but what about wall panels? Wall panels were originally used in heritage homes to provide insulation, yet today wall panels are ideal to add a distinct look and decorative appeal. With well-chosen wall panels made of durable and easy to clean materials, your kitchen will really stand out for all the right reasons. Modern wall panels include timber, pressed metal and innovative materials for a modern home, and there is an array of products available that are ideal for kitchen wall panelling. The right wall panels for the kitchen will not only look fantastic and complement the kitchen cupboards, benchtops and splashbacks, but they will also be durable and easy to maintain. They will be resistant to the growth of mould, and will be easy to keep clean. SmartPanel is a contemporary wall panelling product, SmartPanel acrylic panels are lightweight and durable, and are fitted onto the existing wall. You can choose between glossy reflective look and a trendy matt finish in a number of colours to match your kitchen cupboards and a benchtop. Thin and easy to install, it is moisture-resistant and easy to care for. With great depth of colour, SmartPanel provides a smooth and flawless look which suits a modern elegant kitchen. Wilsonart is a stylish product for decorative interiors of all kinds, and it works beautifully in the kitchen. Décor options include woodgrain, stone, design colour, etc. Wall panels are taken to the new level with Wilsonart writable and traceless surfaces. You can put your favourite quote on the chalkboard just next to the fridge, leave a message for your partner on the markerboard, and rest assured Wilsonart Traceless surface won’t stain or get dirty with finger proof technology. Durallo Panels are crafted from aluminium composite material. They are lightweight, easy to install, and very simple to maintain. If you are looking for a shimmery or metallic look Durallo has it! Available in a range of colours, Durallo provides the perfect solution for the top-notch kitchen. There are other options for wall panels depending on your budget, the style of kitchen you have, and the end result you seek. It’s simply a matter of considering all options, your overall kitchen aesthetic, and your selection of benchtops, splashbacks and cupboards. Just remember to listen to yourself while making decisions.